500 Pearl prepares for a grand opening! Construction crews are finishing up work and officials are preparing to open a 12-story tower at 500 Pearl in Downtown Buffalo. This new structure known as “500 Pearl” includes a six-level parking ramp with 390-spaces, 110 hotel rooms, high-end apartments, 52,000 sq. ft. of office space, and restaurant and retail spaces. Guests and apartment tenants have been welcomed since March occupying the bulk of the event space. The rooftop bar, and the six-lane public bowling alley in the basement are set to open by June of 2019. This $70 Million project is already being deemed successful since five of the 12 apartments (with floor-to-ceiling windows) are rented for as much as $4,800 per month, and the first event took place in the event space this pas February. Over the last 6 years, Buffalo has focused on the redevelopment of older underused office buildings, factories, warehouses, schools, and churches. 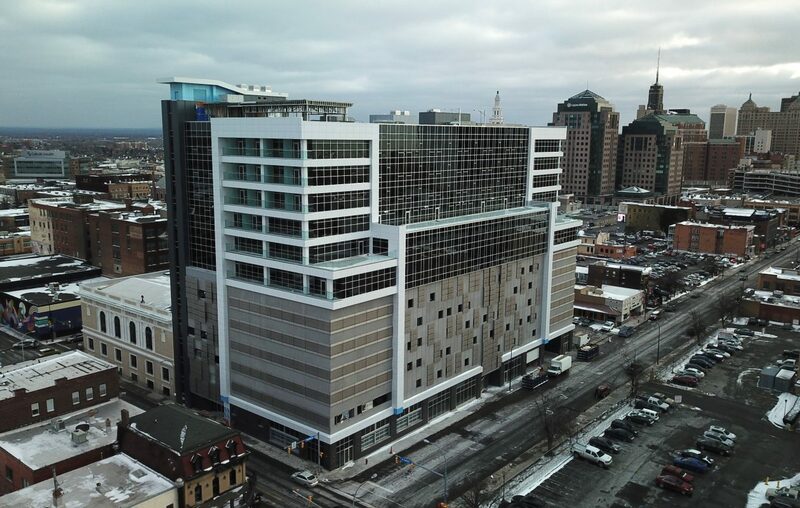 In maintaining that focus, “500 Pearl” was developed by combining a renovated century-old building (once home to the Buffalo Christian Center & Fraternal Order of the Eagles) with a new modern high-rise. The exterior of the structure incorporates a range of materials including precast concrete, smooth and perforated metal panel systems, and glass. Rich & Associates provided parking consulting and architectural design services on the six level 390-space parking structure in association with Kideney Architects and Tredo Engineers.